The MX915 delivers a rich media experience with a powerful processor and generous memory. 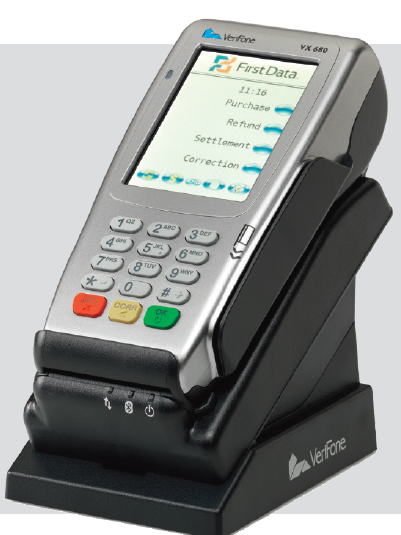 The terminal is elegantly designed, NFC-enabled and supports full motion video. 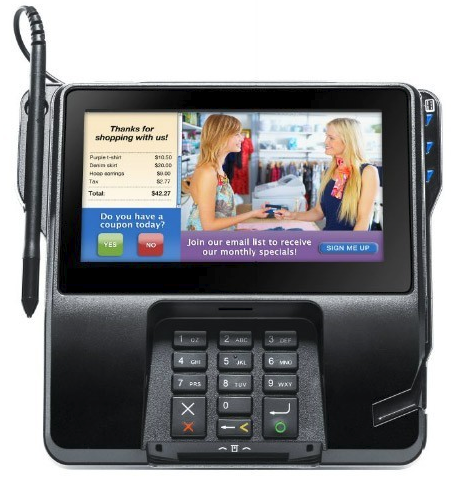 The integrated MX915 solution can easily integrate to your new or existing POS/ECR solutions. 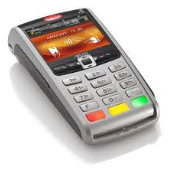 Supports a full complement of contact and contactless credit and debit transactions. NFC-integrated to capitalize on the increasingly popular smartphone transactions, in addition to supporting chip and PIN payments. A typical payment transaction involves a server leaving the check at the table in a billfold. The customer leaves the card in the billfold and waits for the server to return which can takes upwards of 10 or more minutes. Then the customer waits again for their receipt. Increasing table turns means an increase in profits. Every transaction is encrypted and secured; so you no longer store actual credit card numbers. 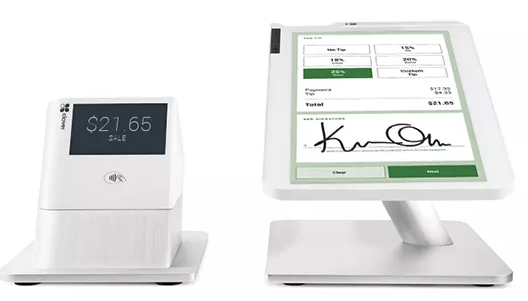 Protect your guests, improve service and even increase business all with the easy-to-use Pay@Table application and terminal. Pay-at-the-table prevents cards from being taken from the customer by servers and skimmed: customer’s credit card data can be collected from hundreds of customers in a week by fraudulent servers who collect the data and sell it for profit. Pay@Table eliminates that possibility by keeping cards out of servers’ possession. Equipped with an array of communication technologies such as high-speed modem or Ethernet, the iCT250 delivers anytime, anywhere connectivity. 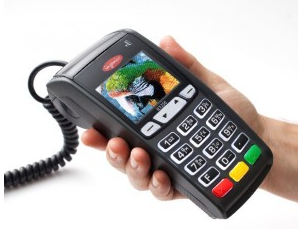 The iCT250 supports the latest PCI and EMV security standards to protect cardholder data. The iCT250 is PCI PTS 3.x certified. 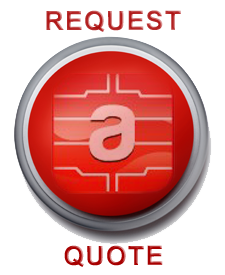 The optional PIN privacy shield provides additional PIN entry confidentiality. Among the world’s smallest and lightest devices, the iCT250 is designed for easy handling and robust daily use. The backlit keypad makes PIN entry and menu navigation easy and intuitive. 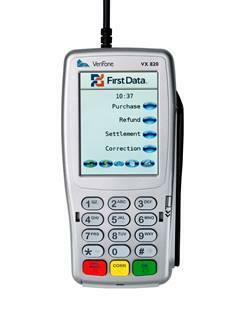 Also, the large keys and power buzzer speed transactions and reduce PIN entry errors. 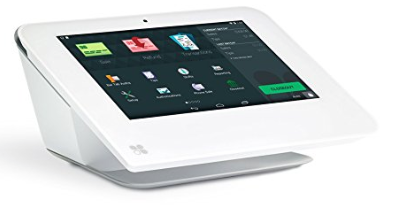 Point of sale system designers have often looked to the Clover Station as the standard in innovative design, ease of use, and integrated performance. 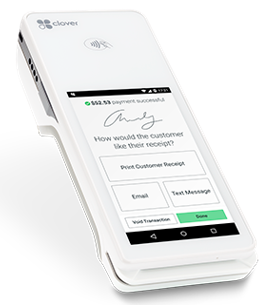 Now the new Clover Station 2.0 is arriving on the scene; storefront owners everywhere are asking what the new Clover POS station has to offer them. A compact countertop POS with guts.